Israeli soldiers invaded, on Friday at dawn, the town of Beit Awwa, southwest of the southern West Bank city of Hebron, and fired several live rounds, concussion grenades, and flares. Local sources in Beit Awwa said the soldiers surrounded the town before invading it, and opened fire on protesters, who hurled stones and empty bottles at the military vehicles. The soldiers also fired many flares, live rounds, and concussion grenades, causing several children to suffer anxiety attacks. The Israeli army said one of its military towers, guarding Naghot illegal colony, was attacked with Molotov cocktails. 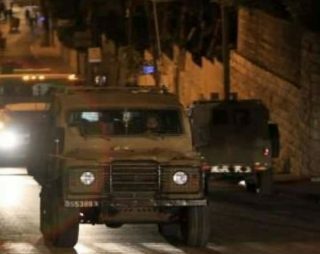 Also at dawn, several Israeli military vehicles invaded Be’er al-Basha village, south of the northern West Bank city of Jenin, and Deir Abu Da’if village, east of Jenin, searched homes and kidnapped one Palestinian.